Juan Cole @ Rising up With Sonali on "Muhammad: Prophet of Peace"
RISING UP WITH SONALI KOLHATKAR: FEATURING JUAN COLE – Islam is the youngest of the world’s major religions – and sadly the most misunderstood especially in the West. A whopping 1.5 billion humans identify as Muslim. Yet there are political forces that have interpreted an extremist version of the religion and there are racist forces that have deemed them representative of all Muslims. 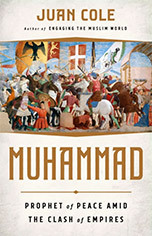 Now, a new biography of the Prophet Muhammad attempts to correct the record on a holy figure that has been maligned by Islamophobes for years. All our interviews are on our website RisingUpWithSonali.com (video and audio format). – KPFK (90.7 FM, in Southern California and 98.7 FM, in Santa Barbara) weekdays, from 8-9 am PST. – KPFA (94.1 FM in the Bay Area, 89.3 FM in Berkeley, 88.1 FM in Fresno, 97.5 FM in Santa Cruz) Weekdays, from 5-6 am PST.- KBCS (91.3 FM, Bellevue, WA); KBOO (90.7 FM, Portland, OR; 104.3 FM, Corvallis, OR; 91.9 FM, Hood River, OR), KCEI (90.1 FM Red River/Taos, NM), KODX (96.9 FM, Seattle, WA), KOWA-LP (106.5 FM, Olympia, WA), KVDG-LP (100.1 FM, Goldendale, WA), KWAQ (91.7 FM, Toledo, OR), KWRK-LP (90.9 FM, Fairbanks, AL), WCRS-LP (92.7/98.3 FM, Columbus, OH), WEZU (88.1 FM, Middletown, CT), WGRN (94.1 FM, Columbus, OH), WLRI (92.9/93 FM, Gap, PA), WPRR (91.1 FM, West Michigan; 88.3 FM, Pontiac, IL), WRFI (88.1 FM Ithaca, NY; 91.9 FM Watkins Glen, NY). *if you are interested in airing our program on your local station please contact us at mail@risingupwithsonali.com. – Free Speech TV (freespeech.org), weekdays, from 3-4 am PST, then, from 3-4 pm PST (Monday, Tuesday, Wednesday and Friday), or Dish Network, DirecTV, and Roku. – On our Vimeo channel, at www.vimeo.org/RUWithSonali.